Life on the beach ls the best !! 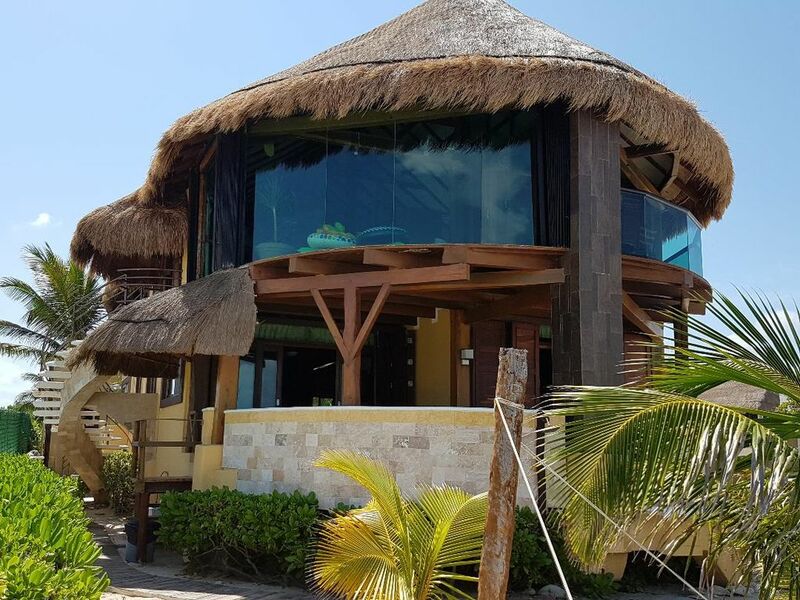 Casa Chanty is a duplex spectacular Vacation Home in Caribbean style perfect for families and groups of friends, ideal for a relaxing, exclusive vacation since Playa del Secreto is for the exclusive benefit of the few tourists who rent on this beach that have no seaweed. We count with a security service at the entrance of Playa del Secreto 24 hours a day . The apartments do not share nothing, only the outside common areas but the long spam of white sandy beach in front the house is so secluted that for this reason everyone can really fully enjoy it . ALL ROOMS have AIR CONDITIONING and ceiling fans. there are 3 full Bathrs.,with spacious showers all bathrs have Ocean View. Or Rent a Car: If you are getting a car for a week or more, book it at least a week out and get it at the airport. because in the riviera maya now the beaches are all quite chaotic and nearby other hotels this magnificent house , it is still located on a wonderful beach clean and not crowded, and this certainly offers a big advantage, being able to fully enjoy the place and the beach as being alone and really is a beautiful sensation. because in the riviera maya now the beaches are all quite chaotic this magnificent house and other nearby hotels, it is still located on a wonderful beach clean and not crowded, and this certainly offers a big advantage, being able to fully enjoy the place and the beach as being alone and really is a beautiful sensation, and at the same time if you want entertainment and nightlife only 10 minutes from the center of playa del carmen and 5 minutes from the center of Puerto morelos, and is a perfect location for excursions as it is halfway from all the major sites. we have customers in love with this location and the house who return year after year, and we are very happy for them. so we hope that you also have the opportunity to visit this beautiful place. secluted beach, clean water , peaceful place , quiet and on site assistance 24 hours, "security"
"Top drawer "accomodations that can not be beat. Everything was very well we really enjoyed the beach! Only thing I did not like was no long curtains in the 2 restrooms, and living room air conditioning was very small and did not feel fresh for the size of living area and upstairs. Dear Michael & family , I'm so happy that you enjoyed the place the house the beach and the staff on the spot thank you very much I really appreciate your review and we all thank you, these things give us satisfaction and encourage us to improve more and more because we want to leave a good memory , we send you our greetings and hope to see you again. This is a wonderful blend of natural beauty, fun and convenience. The property is extremely well run and well supplied. Alberto and his staff are friendly, knowledgeable and eager to see you have a good time. They are great hosts. The best place and experience ever loved it!! We had a wonderful stay at Casa Chanty! The house was very comfortable and the property had many great amenities. On site manager, Alberto, and the staff were very welcoming and bent over backwards to make our stay memorable and fun. Thanks Cristina for all of your advice and assistance as well. Coccodrile park and Botanic Garden in Puerto Morelos.